It’s already Friday and Agents 001 and 002 of the #solarTEAM have a big day ahead of them at #COP21. There are so many events that they won’t be able to team up today. Luckily, they’ve got smartphones! A 002: How is Bertrand Piccard’s speech going at the Health and Environment Alliance event? A 002: Yeah, people tend to forget that he’s not only a pilot and adventurer but also a psychiatrist. A 001: Anything interesting on your side? A 002: No, I’m looking after the model of Solar Impulse at the French pavillon. And checking out the latest UNFCCC video. Yvo de Boer, Director General of the Global Green Growth Institute, made a fun introduction: “My favorite philosopher is Kermit the Frog, because I think he was very right when he said: It’s not easy being green. And my favorite singer is Bob Marley because one of the things that he said is: In the great future, you can’t forget your past.” He knows how to catch his audience. A 001: Well you’re working hard! I recommend you go check out the Electric Pedals that UNEP tweeted about. It’s in part thanks to UNEP that we were able to make it to COP21 by the way. A 001: God you can be so cynical sometimes! It’s exactly the kind of technology that could provide poor communities with a cheap and clean source of energy. Like the portable solar power systems developed by Fenix International amongst others. There are 1.3 billion people who live without power in developing nations. If you take Niger for example, only 14.4 % of the population has access to electricity according to the World Bank. So they use diesel generators, candles and kerosene lamps that pollute and cause millions of fires and burns each year. A 002: We’ll debate later, I’ve got to go, André Borschberg’s speech for Dassault Systems is about to begin. A 001: Are you done? I went for a walk and spotted a cool solution: TOSA, an electric bus that recharges at each stop in only 15 seconds! They call that “flash charging”. Which also means it doesn’t need any of those ugly overhead electric lines that visually pollute our cities. I noticed that ABB, one of our partners for Solar Impulse, also worked on developing TOSA. A 002: Yeah the Dassault event is over and André did great explaining his strategy for Solar Impulse 2. He talked about the engines, insulation, and materials used to build the plane, and how Dassault Systèmes had helped him to make them as energy efficient as possible. Good job for TOSA! For my part I received a notification that caught my attention. 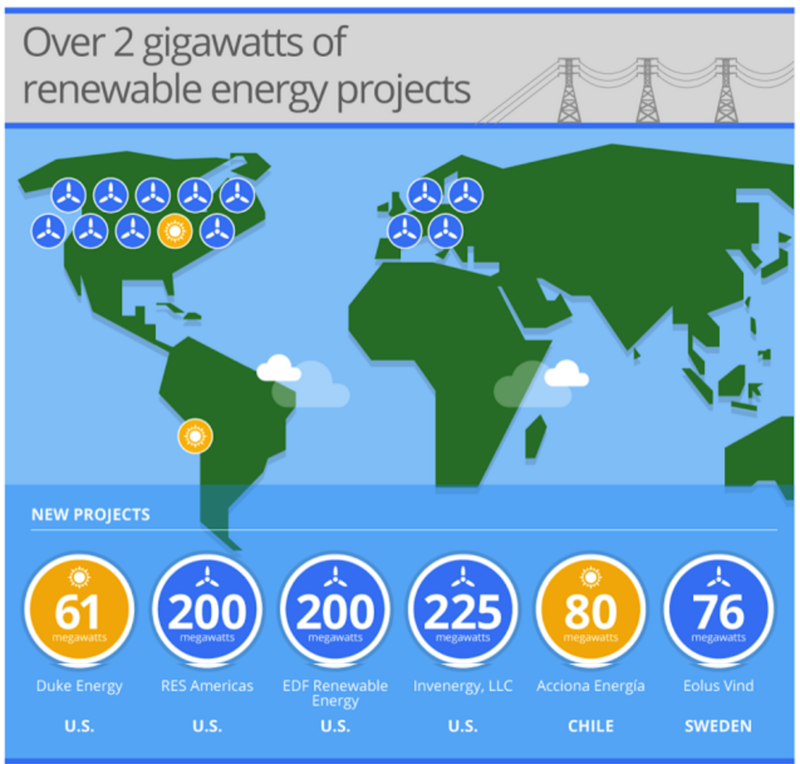 Google announced yesterday “the largest, and most diverse purchase of renewable energy ever made by a non-utility company.” Strategic timing. They’d previously committed to multiplying by three their purchases of renewable energy by 2025, and they’re now up to 2 gigawatts of electricity produced by renewables, which is the equivalent to taking nearly 1 million cars off the road. A 001: What does Google use all that electricity for? A 002: To power their data centers which, amongst other things, allow you to find the answers to all your questions on their search engine. Which means that each search you do emits a couple of grams of CO2. A 001: Damn I hadn’t realized that! Well it’s a good thing they’ve decided to invest in renewables then. What are you up to next this afternoon? A 002: Bertrand’s intervention on “Being human is being responsible” for UNESCO’s Earth University event is about to begin. He’s going to be receiving the Clarins Men Environment Award, which rewards original initiatives in the field of sustainable development, alongside Christian Roland Jourdain. A 001: Never heard about him. A 002: He’s a French skipper who also builds boats using biocomposite materials. They’re starting, talk later. A 001: Have you seen what’s going on at the Grand Palais?? It’s where the COP21 Solutions exposition is supposed to open in a few hours. A 002: No what happened?! A 001: Some green activists decided to condemn what they call the “greenwashing” and “false solutions” of several big firms. The police are trying to evacuate them but they won’t leave that easily. Let’s hope it doesn’t disrupt the opening of the exposition, Bertrand is supposed to give a speech there. A 002: Keep me posted! A 001: It’s all good! The opening is going to take place as planned, and Bertrand and André are currently talking about clean techs and energy efficiency with Alain Juppé, former French minister and current mayor of Bordeaux. A 002: Great! I’ll be there soon, keep me a spot at the front so I can hear Bertrand speak. A 001: Ok but hurry up, it’s getting crowded in here. Good job today Agents 001 and 002. Tomorrow your mission will be to look for clean solutions in the Grand Palais and to report on Action Day. More details to come. And try to get some sleep tonight. M.